This week we look at how to enhance your home brewed beers using a technique called aeration. Aeration with oxygen is very important for fermenting beer, but needs to be applied at the right time to brew good beer. Let’s take a look at aeration and how important it is for brewing great beer at home. Lets start with some basic definitions. Aeration is the injection of oxygen into the wort during the brewing process, usually after boiling and cooling cooling and just prior to fermentation. The act of boiling wort forces most of the oxygen out of solution. Unfortunately, as we covered in our article on fermentation and the yeast life cycle, yeast requires a great deal of oxygen during the “lag phase” when it is rapidly multiplying in the wort. Without enough oxygen, the yeast will fail to reproduce sufficiently, leaving an incomplete fermentation. Before we get to how to best add more oxygen, lets look at two other important terms. Another term you may hear is “hot side aeration”, which refers to exessive splashing or aeration of the wort during the boil or before we’ve had a chance to cool the wort down. The problem with adding oxygen while the wort is hot is that it can oxidize the melanoidins in your beer leading to a stale flavor. A study by the late George Fix suggests that hot side aeration can occur at temperatures as low as 86F (which is pretty low! ), so it is important to cool your wort before aerating it. A third term, called oxidation is closely related to the first two. Oxidation occurs when you add oxygen after the lag phase of yeast growth (i.e. later in fermentation, or after the beer has fermented). In this case, the effect is exactly what is seen when you left your pony keg at college out for a few days with an air pump on it. 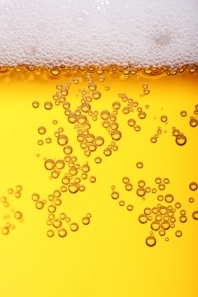 The air oxidizes the finished beer, leaving a strong stale flavor. So you clearly don’t want to introduce oxygen in your beer after lag fermentation has started. So far we’ve learned that hot side aeration is bad, oxidation is bad, but proper aeration of the cooled wort is good. Now lets look at how to put this information to good use in our beer. Yeast needs between 8 and 10 parts per million (ppm) of oxygen to properly reproduce in the lag phase. A level of 8ppm is achievable using air alone (which is 21% oxygen), but achieving a higher level requires a tank of pure oxygen. The best time to aerate your wort is as soon as it is cool. Ideally this can be done during transfer to the fermenter or immediately after transfer to the fermenter. If you aerate after pitching your wort, do not aerate for long as the lag phase generally starts withing a few hours of pitching the wort. Splashing – Splashing the wort around in the fermenter can actually add some oxygen to the solution. You can achieve the same effect by splashing the wort around during transfer – for example using a cap at the end of the siphon that splashes the wort out the side a bit. While splashing will not achieve as high an oxygen content as injection, it is a good option for those on a limited budget. Splashing is far superior to no aeration at all. Agitation –Agitation is done by stirring rapidly with a spoon, whisking the wort around with a wisk or rocking the entire fermenter. Generally a sterilized whisk is best if you have open access to the wort. Whisk the beer vigorously for several minutes before adding your yeast. Agitation is a step above splashing, as it generally gets more oxygen into the solution. Injection – There are many ways to inject air or oxygen directly into the wort. The simplest setup involves using an inexpensive aquarium pump with a inline sterile filter. Note that the filter is needed to prevent bacteria and other organisms from being drawn in with the air. I also recommend using some kind of carbonation stone or aeration stone at the end of the tube to help diffuse the air. Care must be taken to sanitize the stone and tube before using it. A more elaborate injection system would use an actual oxygen bottle and regulator to inject oxygen. However, even the relatively cheap aquarium pump injection system can achieve the 8 ppm ideal aeration level needed for your wort. For many years, I used the splashing/agitation system, but for less than $25 you can move up to an aquarium pump, filter and carbonation stone and significantly improve the fermentation of your beer. I will add a final note – don’t forget the use of a properly sized yeast starter, for without a starter you still risk poor yeast production and subsequent problems in your beer. Thank you for joining us on the BeerSmith Home Brewing Blog. Don’t hesitate to subscribe, tweet or bookmark this article if you enjoyed it and also check out our BeerSmith Home Brewing Guide for more great articles. Great article. An easy and cheap way to really improve your beer. The small oxygen tanks can be bought relatively cheap from your local hardware store to attach to the stone. I use the O2 system with an aireation stone I purchased on-line. The problem I had was I bought two dud tanks. The first was empty and the second only lasted for one batch. I did not know this until I tried to oxygenate my next batch and ran short of O2. I would like to buy an air pump for a backup so this never happens again. Where do I get the air filter that was mentioned above? I would recommend any of the popular online beer stores. Most of them carry sterile air filters that usually cost from $5-10. One trick I’ve used is to drop my immersion chiller into the wort for the last 10 minutes of the boil. That sterilizes the chiller. Then when the boil is over I crank up the water and cool the wort. When the wort is cool enough, I raise and lower the chiller in the wort, which does a good job of aerating it because it gets a lot of surface area exposed to the air. For aeration I use A 12″ to 14″ section of 1/2″ copper tubing with several tiny holes drilled in it, about 5″ to 7″ from the discharg end. I use a pump to tranfer the wort from the boil pot through a counter flow chiller. This gives me a 5″ head of bubble foam. I get very good results for next to nothing. I have done all of the other stuff and will stick with this for another 20 years, God willing. It should ferment – I would let it go. You should be able to tell if it is fermenting – the bubbler on the airlock should be bubbling away if you have it properly sealed. Hi Brad and thanks for the article. I bought a small aquarium pump just last week with an air stone and used it for the first time yesterday. Do you know how long it needs to run for in order to achieve ~8ppm using air (not O2)? Mine says it runs at 1.3L/min. I would recommend a minimum of 45 minutes for an aquarium pump (make sure you have some kind of filter to avoid pumping micro-organisms into your beer). An hour to 90 minutes is probably best. Do this before pitching the wort. Ok, I’ve been searching the web for hours tonite, trying to get a grip on the proper amount of pure oxygen to inject via a .5 micro SS airstone into a typical 5.25 gallon batch of – let’s say – 1.050 OG wort at 70°F. The closest “solution” I’ve gleaned so far was from http://www.byo.com/stories/wizard/article/section/121-mr-wizard/147-are-welding-oxygen-canisters-safe-for-homebrewing-aeration – which assumes 100% absorption and claims roughly .112 liters is sufficient to reach 8ppm. I buy the math, but I’m not buying the 100% absorption, without an actual test using a Dissolved Oxygen meter, as it is well known that absorption decreases with increased SG – which to me means absorption is never 100%. So I’m curious if anyone out there has ever correlated the volume of pure oxygen injected into wort at pitching temperature and known OG with the resulting dissolved oxygen content. I’d do this myself but I’d rather put the ~$160 price of the least expensive DO meter I’ve found into continuing my brewery upgrade to an all-stainless steel operation. Very informative, but minor correction needed: change “lag” to “log”. After cooling, I provide aeration by tipping the wort from one fermenter to another a few times, what are the pros and cons of using this method. For 35 batches, I’ve cool aerated by pouring the wort and aggressively splashing into another sanitized bucket, waterfall effect. 3-4 transfers max and have never had a problem with fermentation. I’ve found that a very cheap and effective aeration method it to pour the wort into the fermenter through a strainer/colander. The finer the mesh and higher you pour from, the better. Very Informative ideas. I Appreciate the insight. I was just looking for this information for some time. I have recently started a web site, the information you offer on this website has helped me greatly. Thanks for all of your time & work. How about?? Nano-brewery size, 125 gallon fermenter, filling the tank with oxygen, then filling it from the top so it splashes its way in? Or I could just inject it after the wort chiller. I already have the Oxygen tank and regulator/flow meter from my welding set up.